You are here: Home / Quilting / Quilt for my buddy Brian: you can help, too! Quilt for my buddy Brian: you can help, too! My friend Brian and I go back. Brian lives in Colorado Springs, and this summer, his home was destroyed in the Waldo Canyon Fire. While I want to be able to do something to help him out, I admit to feeling a bit helpless. There’s not much I can do from Virginia other than offer my good wishes and let him know he can tell me if there’s anything I can do to help him. Which I’ve done, but I’ve still felt like I would like to offer something more. It finally occurred to me that I could make him a quilt. He’s rebuilding his house, and I hope a quilt will be something he can use and that will help make his new house “home.” This is going to be a large queen sized quilt, composed of 42 16-inch blocks, so if you’d like to contribute a block or two, I will happily accept them. Here’s what I have planned. Blues (especially dark blue), greens, and grays. “Man colors.” Nature inspired. Like rocky mountains covered in trees. Mix of prints and solids. Nothing too flowery. I found a quilt pattern called “Turning 20 Again.” It is basically a simple patchwork that has various sized patches. It seems very man friendly, and while I don’t own that pattern specifically, I used the design to come up with some cutting directions for a similar block. I’ve been working pretty freely on these, without much forethought before I actually get into cutting the fabric. I begin by cutting the large square and work out from there, adding fabrics that I feel look nice in that position. When you have all your pieces cut, lay them out to make sure you are happy with that arrangement. Use a scant 1/4 inch seam allowance for all seams. 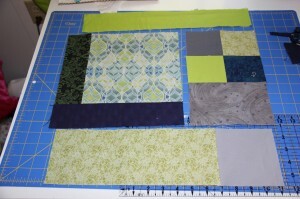 Begin by sewing the four small squares together into a 4-patch block. Add the short rectangle below that. Construct the second section by sewing the shortest strip to the large square. Add the medium strip to the bottom of that piece. Sew the large rectangle to the medium square to make the bottom strip. Attach the two middle sections together. Sew the rows together. Trim the block to 16.5 inches square. Here are the blocks I’ve completed so far to give you an idea of the color scheme I have in mind for this project. When the quilt is finished, the blocks will be turned to different positions to give an all over patchwork pattern. Fun! If you’d like to help with Brian’s quilt, you can comment here, or send me an email and I will get back to you with my address. You can see the colors and fabrics I’m using in the blocks above, but there’s a better view of the fabric (and thus, the color palette) here. http://sewingbymoonlight.com/wp-content/uploads/2014/03/header-edit3-1030x286.jpg 0 0 sewingbymoonlight http://sewingbymoonlight.com/wp-content/uploads/2014/03/header-edit3-1030x286.jpg sewingbymoonlight2012-09-13 16:30:572015-08-11 19:59:49Quilt for my buddy Brian: you can help, too! How many blocks do you want and what is the deadline? 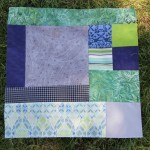 Hi, I have made a block for you, and posted a pic on Flickr, in the Quilting for a Cause group.